US satellite radio firm XM is being sued by record labels over a gadget that lets listeners record songs. The recording industry said XM's Inno device, which stores music and divides it into tracks, infringes copyright. 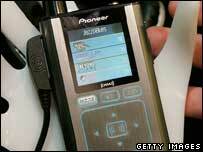 The lawsuit seeks $150,000 (£79,537) in damages for every song copied by XM customers to an Inno gadget. XM defended itself by saying that music stored on the device cannot be moved elsewhere and only lasts as long as a customer is a subscriber. The Inno device turns a radio broadcast into a download service that resembles Apple's iTunes, said the Recording Industry Association of America in its lawsuit. The RIAA represents record labels such as Vivendi Universal, Sony BMG, Warner and EMI. XM said it would defend itself vigorously against the legal action. It added that the Inno does not let people download music on demand like iTunes and only lets listeners record radio shows as the law has allowed for "decades". The device went on sale in early May. The lawsuit comes after talks between the RIAA and XM on licence agreements for the Inno device broke down. The RIAA and XM are currently re-negotiating royalty contracts for radio broadcasts. XM's rival Sirius Satellite Radio recently agreed to pay the RIAA licence fees for its S50 recording device.